I have just written a news feature for aidsmap.com analysing the recent conviction of an HIV-positive man in Texas to 35 years in prison for spitting at a policeman. The first few paragraphs are below, but to read the article in full, click this link. A 42 year-old HIV-positive man from Texas who spat at a police officer during his 2006 arrest for being drunk and disorderly has been sentenced to 35 years in prison by a Dallas court and must serve at least half of his sentence before being eligible for parole because the jury found that his saliva was a deadly weapon. 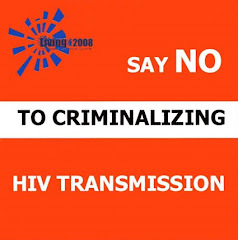 The case, which was reported by more than 175 news outlets yesterday, has outraged UK HIV organisations, particularly since only three reports – from The New York Times, USA Today and the Mississippi Clarion-Ledger – actually mention that HIV cannot be transmitted via spitting. Lisa Power, Head of Policy at Terrence Higgins Trust, added: "The saliva of someone with HIV is not a deadly weapon. Putting someone with HIV in a situation where they cannot access condoms, treatment is poor and they may have little choice about sexual activity is a far more dangerous thing to do, and US clinicians need to tell the Texas legal system so." This is horrible, outrageous and stupid! Can't we organize spitting demonstrations in front of US embassies?